Our great-great-great-grandchildren, many times over, could leave our current universe by migrating to a natural or artificially created “basement universe.” A future civilization would link the new universe to the old one with a wormhole, and use it for living space, computing—or to escape an old, decaying universe. “In, through...and beyond.” Disney’s The Black Hole (1979)—a good idea, but poorly executed. This may seem outlandish, but this idea has been explored by some serious scientists, including theoretical physicists who take the occasional deep dive into black hole theory and inflation cosmology. Theoretical physicist Lee Smolin of the Perimeter Institute and Stanford string theorist Leonard Susskind have speculated that universes spawn other universes in a natural, evolutionary process, known as cosmological natural selection (CNS). They argue that the cosmos is not just randomly ideal for the development and proliferation of intelligent life—but in fact, our universe may have actually evolved to be that way. Smolin suggests that baby universes are reproduced through black holes, and that our Universe is nothing more than a glorified black-hole generator. Making baby universes via black holes is thus the “utility function” of the universe. Likewise, Susskind’s theory invokes black holes, but he adds the nature of “inflation”, the force that causes the early universe to expand rapidly. ...Guth likens the universe in which we live to the two-dimensional surface of a sphere which, because of its immense size, appears to us to be almost perfectly flat. There are circumstances, he says, in which an ‘’aneurysm’’ could develop on this surface, a region in which space and time bulge like a tumor, eventually pinching itself off from its parent into a new universe. To a hypothetical observer inside the bulge, conditions might initially resemble those of the Big Bang explosion from which our own universe is thought to have arisen. But to observers in our own universe, Dr. Guth said, the aneurysm would merely resemble a black hole — a supermassive object whose immense gravity prevents the escape even of light. After a certain amount of time the black hole would evaporate, leaving no trace of the place where a new universe had been born. But once the bulge separates from the host universe, the new universe will exist in a totally separate space/time continuum. Any communication between the two universes would be impossible. More encouragingly, philosopher Nick Bostrom and cosmologist Milan M. Ćirković put out a paper in 2000 arguing that an advanced civilization might actually be able to not only engage in this kind of universe-engineering—but it might also be able to transfer information directly into this baby universe. This information could conceivably include uploaded minds, which would make the prospect of immortality a very tantalizing one, indeed. And it’s not crazy to imagine that we could send our minds through a black hole, once they were uploaded to a computer. Fifteen years, ago physicist Seth Lloyd argued that black holes are the densest and most efficient computational devices capable of existing in our universe. His “ultimate laptop” consists of a kilogram of compressed matter shrunken down to an absolutely miniscule black hole. Owing to Hawking radiation, this computation engine would only last for a fraction of a second (10-19 seconds to be exact), but during that time it would perform about 1032 operations on a 1016 bits. Inspired by this idea and those of Smolin and Susskind, futurist and systems theorist John Smart has connected the prospect of baby universes, whether they be natural or artificial, to the Fermi Paradox, i.e. the realization that we have yet to see signs of extraterrestrial intelligences when we should have by now. It’s conceivable, he says, that all advanced extraterrestrial life rejects its universe of origin, in favor something more interesting in the Great Beyond. Smart calls this the Transcension Hypothesis. “The more we study universal history, the more it seems every major complexity transition, from galaxies, to life-catalyzing planets, to eukaryotes, to prokaryotes, to humans, to cities, and now, to intelligent computers, occurs via a process I call STEM compression of information production,” Smart tells io9. By “STEM compression,” Smart is referring to a process in which complex new systems are almost always both denser and more efficient users of Space, Time, Energy, and Matter. This, in turn, causes information, complexity, and intelligence to develop at an accelerating rate. Over time, we’re packing more and more of our stuff into smaller spaces, while simultaneously making more efficient use of information. As a result, intelligence is always racing to inner space, of which there are two types: physical inner space and virtual inner space. “Our destiny is density, and dematerialization,” says Smart. This all brings us back to the question of our long-term survival prospects. There’s a very distinct possibility that our posthuman descendants will exist as digital beings, the offshoots of uploaded minds, or the products of entirely new minds and mind-types altogether. True to Smart’s theory, these individuals would be vastly more dematerialized and “immortal” than biological beings. But what about the future of human civilization itself? So we could be sending our virtual selves through a black hole, if “black hole information theory” is correct. And the holographic principle also offers some clues as to how this might actually happen. But Smart says many questions remain. “If all universal civilizations ultimately transcend to black holes as our universe dies, will we do so as informational ‘seeds’ or as conscious entities?,” he asks. His concern is that, like an uninstantiated person in the midst of being teleported in a Star Trek transporter, a digitized mind could end up existing as useless chunks of data floating in the cosmological ether for an eternity. If our distant offspring can’t find an existential “escape hatch,” whether that be a black hole or a new universe, than it may be incumbent upon them to find other, even more radical solutions. The other option is to change the rules of the cosmological game—and change the very fabric of the Universe itself. In the end, intelligence may prove to be the most powerful force in the Universe. The idea that intelligence is not an isolated or epiphenomenal aspect of the Universe is not a new one. The Jesuit philosopher, theologian, and scientist Pierre Teilhard de Chardin believed that humanity was greater than the sum of its parts, and that something profound awaited our species in the future. True to his Christian sensibilities, Teilhard disagreed with the scientific convention of classifying the human animal according to our physical characteristics, thus relegating us to one small species in the entire order of primates. Teilhard observed that virtually all nonhuman animals display an amazing capacity to adapt to their environments, while humans have learned to make tools that are actually separate from ourselves. With the establishment of written language, libraries, and powerful communication tools, humans took gigantic leaps that exceeded their physical constraints in dramatic ways. Humanity, thought Teilhard, was in the process of becoming a single organism with a single nervous system, that was increasingly tightening its hold on the planet. He took the concept of the biosphere one step further, giving rise to the concept of the “noosphere.” Teilhard saw no reason why humanity’s reach couldn’t extend even further than that, inspiring the philosophers, futurists, and scientists who followed in his wake. Indeed, Earth has recently entered into a new geological era, one dubbed the “Anthropocene.” Scientists have finally acknowledged that human intelligence is force of nature unto itself—one that’s reshaping the planet, both for better and for worse. In future, there’s no reason to believe that intelligence won’t continue to exert itself on its environment, whether it be a planet or an entire star cluster. So will the universe end in a big crunch, or in an infinite expansion of dead stars, or in some other manner? In my view, the primary issue is not the mass of the universe, or the possible existence of antigravity, or of Einstein’s so-called cosmological constant. Rather, the fate of the universe is a decision yet to be made, one which we will intelligently consider when the time is right. Intelligence, predicts Kurzweil, will eventually prove to be more powerful than any of the universe’s big “impersonal” forces. Complexity theorist James Gardner took this idea to its furthest extreme, by arguing that the life-friendly nature of the universe can be explained as the predictable outcome of natural processes, including life and intelligence. According to his “selfish biocosm” theory, “the emergence of life and ever more accomplished forms of intelligence is inextricably linked to the physical birth, evolution, and reproduction of the cosmos.” In other words, intelligence exists in the Universe not by accident; rather, it’s a deliberate and purposeful force of nature. [We] and other living creatures are part of a vast, still undiscovered transterrestrial community of lives and intelligences spread across billions of galaxies and countless parsecs who are collectively engaged in a portentous mission of truly cosmic importance. Under the Biocosm vision, we share a common fate with that community—to help shape the future of the universe and transform it from a collection of lifeless atoms into a vast, transcendent mind. Gardner’s theory is interesting in that it applies the Strong Anthropic Principle—the philosophical idea that the laws of the cosmos make life not just possible but inevitable—in such a way that life itself becomes responsible for the very presence of the universe. But the Fermi Paradox could suggest otherwise. A so-called Great Filter may be in effect, that precludes intelligent life from advancing beyond a certain developmental stage. And you could argue that the laws of the universe, as they’re currently set up, actually prevent life from advancing to a futuristic space-faring, universe-engineering phase. As unlikely as it seems, however, the cosmological situation could change billions of years from now. 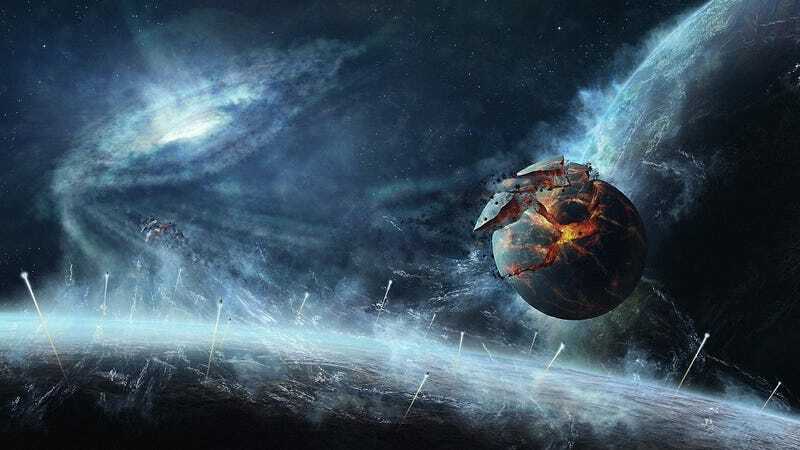 Similar to how our Solar System was chaotic and grossly uninhabitable billions of years ago, the Universe may likewise become “safer” and more hospitable towards superintelligence in the far future than it is today. Once that developmental stage is reached, there may be no limits to what superintelligent civilizations could do to ensure their own long term prospects. Sadly, it’s fair to wonder if our civilization didn’t show up too early in the history of the universe, to take advantage of this opportunity to shape it. An earlier version of this article misspelled the name of Edward Farhi.